Like the other boroughs, The Bronx had its own system of trolleys and tracks, the longest being one by the Manhattan Railway Company that ran on Melrose and Webster Avenues in the Melrose, Morrisania, Mt. Hope, Tremont, Fordham, Bedford Park, and Norwood; it continued along Gun Hill and White Plains Roads all the way to Mount Vernon. Other lines, like the one on Kingsbridge Road we’ll see here, radiated from that line like branches from a tree. 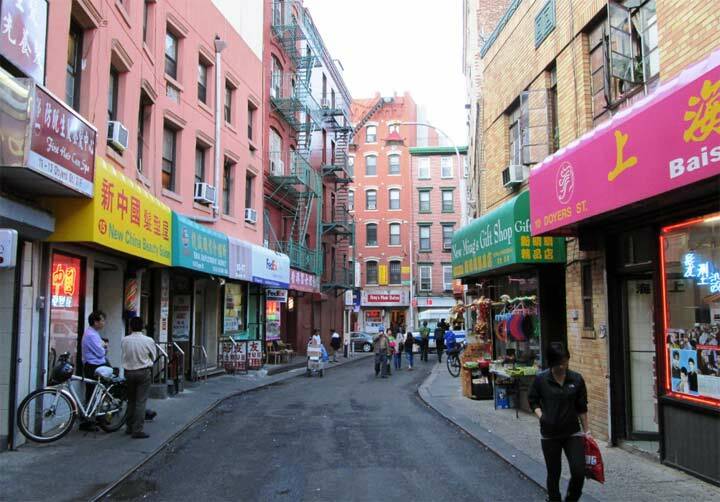 Like many other thoroughfares that intersected the Grand Concourse, Kingsbridge Road, an ancient colonial trail, was built on an underpass to allow traffic to breeze through. But auto traffic wasn’t the only sort of traffic that used the underpass. 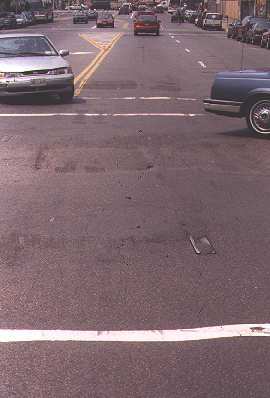 Striations in the pavement seem to indicate that there was indeed a trolley line on Kingsbridge Road. 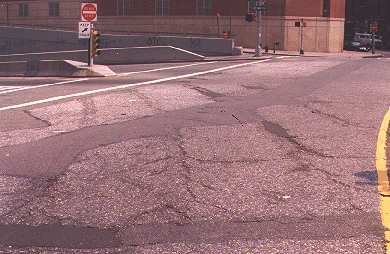 Pavement has worn thin at Kingsbridge Road and Valentine Avenue (background) allowing some tracks to poke through. Some remnants of the Bronx’ premier trolley line on Webster Avenue remain. This track pokes through at Webster and 195th near Fordham U. Before there were subways and modern buses, Bronxites used trolleys to get around the borough. For the uninitiated, a trolley was about the same size as a bus, but ran along the middle of the roadway on rails embedded in Belgian block. It was powered by electrical current coursing through copper wires strung high over the street transferred to the trolley by long pole on the car’s roof which pushed up tightly against the wires. At the end of the pole was a pulley, called a troller, that ran along the wire. People insisted on calling it a trolley, a name that was eventually attached to the car itself. In the first decade of the twentieth century, there were eight private companies running trolley lines in The Bronx. 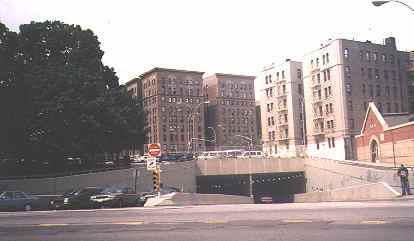 The longest line was run by The Manhattan Railway Company from the elevated station on 129th Street and Third Avenue in Manhattan along Melrose and Webster Avenues to Gun Hill Road to White Plains Road to Mount Vernon. 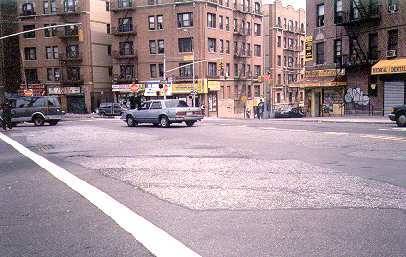 Several crosstown lines were established to intersect with the Third Avenue El as it was built along the central corridor of The Bronx. The fare on all Bronx trolley lines was a uniform five cents, except for the shortest, the Pelham Park and City Island line that ran under three miles the New Haven Railroad’s Bartow station in Pelham Bay Park to City Island’s Belden Point. It charged five cents to ride to the bridge and another five cents to ride anywhere on the island. Trolley cars were made of wood, and this gave them an advantage in the changing seasons. Open sides with wrought iron grating created cool breezes for summer passengers riding along at 35 miles per hour. These were replaced in winter by solid wooden sides with glass windows to keep out the bitter cold. After World War I, operating costs skyrocketed, but the companies were not permitted to raise fares. Later, they shortened or abandoned lines. All Bronx trolley routes were eventually consolidated into one company. After World War II, rail-bound trolleys picking up passengers often blocked increased auto traffic. Thus, buses were gradually substituted for trolleys until the last Bronx trolley made its run on August 21, 1948. I lived in the area of Kingsbriodge Rd. & University Ave. The University Ave. Trolley ran right down the hill from Kingsbridge Rd. going south. As it passed our block of buildings the sound echoed throughout the courtyards of our square block. One weekend a cousin who lived in the country spent the weekend. On Sunday morning he asked me. “How can you sleep with all that racket all night long” I said, “What racket?” He said,”That trolly car every half hour!” Of course, I never heard the trolley. I spent the following weekend in Spring Valley N.Y at his house. I asked him the same question. The din of the crickets and bull frogs around the lake kept me awake all night. He said he never heard them. I lived on Valentine Ave at Kingsbridge Rd in the 40s & 50s. I remember the treollys and the cobblestone streets that the tracks ran on. I remember my dismay when they paved over the cobblels. They’re still there under the pavement.